Rotation, which is a common issue with fitting custom corneal GP lenses and soft toric lenses, and previously scleral lenses, is usually remedied with prism ballasting which adds thickness and weight to the lens. The added material can make fitting the lens more difficult and does not always promote a healthy lens fit. The beauty of the Custom Stable Elite lens is the stability from rotation without the need for prism ballasting. 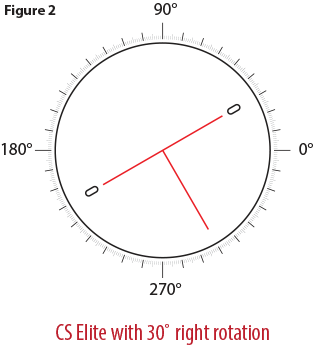 Once an optimal fit is achieved with the Custom Stable Elite you now have the ability to incorporate a sphere/cylindrical over refraction with the confidence of knowing rotation will not hinder the clarity the patient sees in the over refraction. Factoring in your over refraction including cylinder is a simple process and can be finalized either before the order is placed or with the help of a consultant. Here are the key steps you will need to take when factoring in the cylinder and axis either on your own or with a consultant. 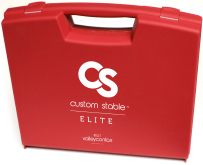 Following your Custom Stable Elite Fitting Guide, make any alterations to the Custom Stable needed to achieve a healthy fitting lens. Sometimes making changes to the fit can alter the amount of rotation in the lens, so I recommend making any dramatic fit changes before incorporating cylinder. 4. 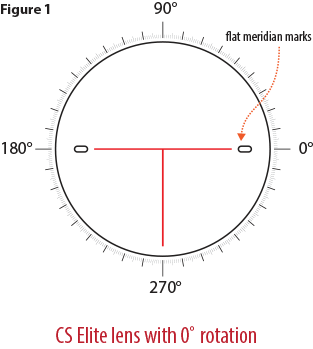 Use the LARS method (Left Rotation= Add, Right Rotation=Subtract) to figure your new axis based on the rotation of the flat meridian laser marks - Example: Original OR axis is 90, you have 30 degrees to the right rotation, so subtract 30 from 90 to get your new axis equals 60. On a plano trial lens your final lens power will be -2.25 -1.50 x 60. Your custom lens will come with some additional lasering to ensure that the rotation and axis were factored in correctly. 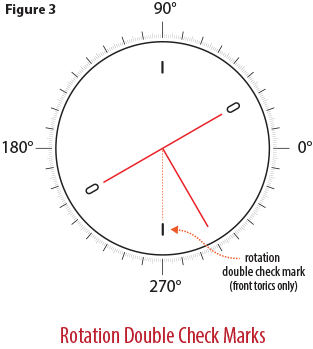 These are called Rotation Double Check marks and if your rotation is consistent they will always orient at 90/270 on the eye. see Figure 3 Having the double check system in place increases the accuracy of locking in cylinder. Valley Contax is the world's leading independent custom contact lens manufacturer. Since 1981 we've built a reputation and following for exceptional products and customer service. From our state-of-the-art facilities in Springfield, Oregon we staff the industries most talented lab technicians, customer care representatives and consultants. Contact us today, we'd love to get to know you.